When Jesus spoke on the mountain to a group of insignificant, uneducated men of Galilee, why didn’t He say, “You are the sugar of this earth and shadow of the world?” Instead, why did Jesus clearly command to be the salt and light of this world? What did Jesus really mean by that? 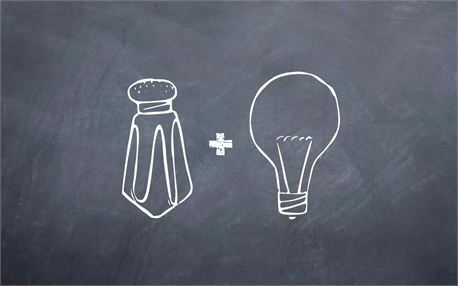 The meaning behind this intentional metaphor fully crystallizes only when we genuinely understand the nature and function of salt and light. Jesus, in essence, commands us to different. We are to be in the world but not of the world. Preservative – A key feature of salt is to serve as an antiseptic, preventing the degeneration of food. Antiseptic can work only if only the salt is rubbed into the meat. As Christians, we must be in the world, facing what the world offers but not be of the world embracing its worldly values and ethics. As a moral antiseptic, Christians will benefit the secular society by preventing the corruption of society in the moral decay. Flavor – Without salt, the food becomes rather boring, tasteless, and insipid. Likewise, without the Good News and Christian behaviors, there is no true flavor in the world. No true joy can be accomplished without perfect flavor that Christians provide. In Greek, the verse reads, “You and you alone are the light of the world.” Shining is not optional for light. It is a key feature of light. Likewise, we as Christians must understand the function of light. Expose Reality of Evil – light will make all the wickedness and rottenness visible. The Bible will help you expose the wretchedness of this world. Psalm 119:105 says, “Your words is a lamp to my feet and a light to my path. Enlightens us to God – the light of the world will open the blind. We think being blind is bound my physicality. God clearly points out we are spiritually blind. Our sinful nature naturally is inclined to relishing the darkness within us. Shows the Way Out – light points to the way out of the darkness. The tunnel of hopelessness, meaninglessness, death, and hell is illuminated with the light of the world. Christians must provide an unobstructed view of the cross to those in whom we come in contact with. The exit is toward Jesus Christ, our salvation. If you were looking for a magical secret recipe of gaining flavor and shining, here you go: Live a different, holy, and purposeful life. Be filled with the Holy Spirit day and night. Sounds mightily simple? Sounds like a platitude? What may seem like the simplest is sometimes the hardest to achieve. By building habits of unshakable foundations which includes practicing the beatitudes, praying fervently, reading and reflecting over the Bible, your very existence will exude flavor and beacon of light in this world. After few hundreds of hours of quiet time, I concluded starting a blog would perfectly fit my set of giftedness to influence my fellow Christians and non-believers to be the salt and light of this world. It is my sincere hope that you will join me in this purpose. Question: How are you living as the “salt and light” of this world?